The Iris is a perennial herb that starts out from a bulb and grows to display beautiful showy flower heads. 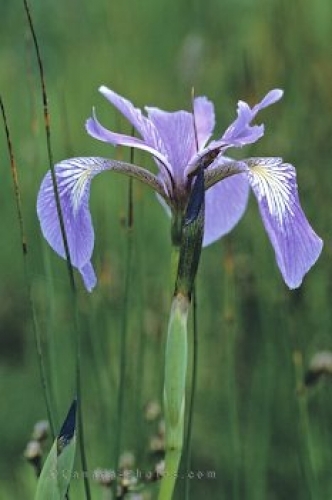 The Iris is a shallow water plant that flourishes along the lake shores and in damp fields in Ontario, Canada. The flower is usually blue in color with yellow and white markings on the base of each sepal and grows to be about two to three feet tall. Picture of an Iris flower in Ontario, Canada.